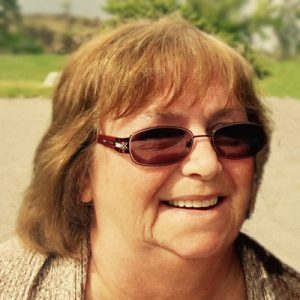 Linda passed away on October 27, 2018 in Kelowna, BC at the age of 64. She is survived by her daughter Jennifer (Jonathan) Poole, son Aaron Dunlop, grandchildren Ashleigh (Tyler) Christensen, Katie Wichman, Madison Poole and Emma Poole, great grandchildren Natalie Christensen and Brynn Christensen, sisters Wendy Givens and Sandra Freeman and brothers Dale Givens, Terry Givens and Ralph Givens. Linda was born in Kelowna, BC in March of 1954. She moved around the province of BC throughout her lifetime, mainly settling in Quesnel where she raised her 2 children. Linda worked many years as an Administrative Assistant. She loved cooking, baking, canning, crocheting, knitting, sewing and spending time with her grandchildren and friends. Linda will be remembered for her faith, her love of games, her laugh and her gentle spirit. She had some health issues and battled Crohn’s disease for the majority of her life. The service for OAKES, Linda Norma Marlene is scheduled for Saturday, November 17, 2018 at 1:00 pm . Below you will find the map for the service location and the contact information should you have any questions. To the family and friends of Linda I send my deepest sympathies for your loss. She is truly missed as my friend and neighbour not just by myself but also by my dog Mona who looked for Linda every day.